Stir all the ingredients and 1/2 cup water over low heat..stir until the mixture boils. Remove from heat. Set aside. The sauce will thicken when you leave it standing. Keep in airtight container in refrigerator…can last up to 2 weeks. 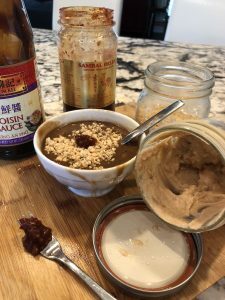 I use this PEANUT sauce as a base for my HOISIN dipping sauce..when I am ready to make my hoisin/peanut sauce for my spring rolls..I put in equal parts. In a small bowl…add all the ingredients. You can microwave for about 30 seconds or add 1 Tablespoon HOT WATER. I have a water machine and it dispense HOT water so I used that. Stir really well so all the ingredients incorporated. 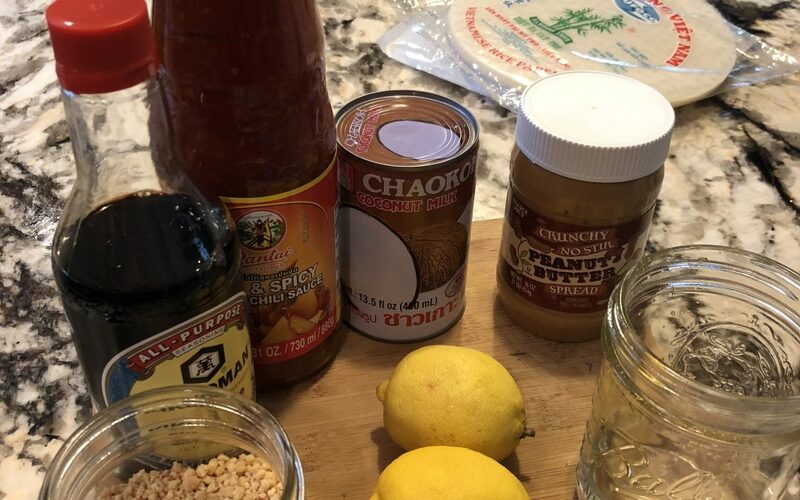 NEXT, sprinkle some crush peanuts on top and add some chili if you like it spicy. 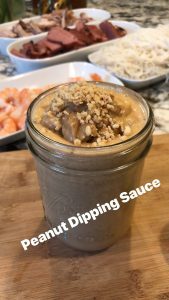 NOTE: the pre-made peanut sauce is thick…so you can diluted it with some HOT WATER.